A high-quality euro-arthouse movie like Roman de gare (but probably better), more subtle than its subject matter would seem to warrant. Chabrol’s rep as the French Hitchcock is either exaggerated or based on his movies that I haven’t watched yet, because this and L’Enfer and Le Beau Serge aren’t so Hitchcockian. Gabrielle (Ludivine Sagnier of Love Songs and 8 Women) falls for rich old guy Charles (François Berléand of the Transporter trilogy and Au revoir les enfants). 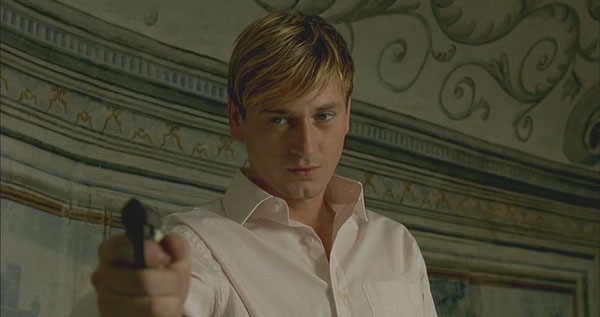 Charles has an unexplained antagonistic relationship with young flamboyant rich guy Paul (Benoît Magimel, the young lover in The Piano Teacher). Paul falls for Gabrielle and wants to marry her, take her away from Charles. This isn’t all happening at once like the trailer implies, though. First G. has a long impassioned affair with lying, married, sexually deviant Charles, who often acts cold towards her and pretends he doesn’t want her anymore. Girls love that, so she keeps coming back. Then after he’s left her for good and she’s super-heartbroken, she finally agrees to go out with Paul, who arrives screaming with crazy hair, all Written on the Wind, being held in check by his chauffeur. He cleans up his act so G. will go out with him, but sometimes he loses it and tries to strangle her. Girls love that, so she keeps coming back, and a year later they get married. Then at a ball, Paul shoots Charles to death, goes to jail, and disowns Gabrielle, who goes on to act as the beautiful assistant that gets cut in half in her uncle’s magic show. I liked, but didn’t love it. Fun ending, great acting. I thought Caroline Sihol as Paul’s mom looked familiar, but I haven’t seen anything else she’s been in (some Truffaut and Resnais and La Vie en rose). Based on a true story in 1906 New York, but transplanted to modern Europe. Movie contains a conspicuous mention of Woody Allen, who himself is from early-1900’s New York and transplanted to modern Europe. Serving as both subject and object, Gabrielle is a deliberately confusing amalgam of striking dualities. […] The appeal Gabrielle holds for Charles and Paul in particular is symbolized in the shorthand of her last name: Snow. Attracted foremost to her youth and naivete – signifiers of virtue – the competing suitors often affectionately describe her as either “innocent” or an “angel.” […] Chabrol ingeniously suggests that the inability of the men to accept her complexity results in a reductive worldview that inexorably leads to a violent ending. The film takes the form of a thriller, but it doesn’t have the pace of one. Still, all that careful, deliberate table-setting allows Chabrol to establish the complex dynamic between the three characters and underline the role that money and privilege plays in sabotaging Sagnier’s life.